It combines what he presented as independent music genres in his first two sound carriers (CD´s). The symbolism of the title – may it be coincidental or not – shows his ideas and intentions accurately. The Y-Project stands fot two paths that have been brought together and will be a part of a bigger whole later on. Christoph Köpf got to know many cultures all over the world. He sat around campfires with many musicians and played an stage with them, always putting in his own interpretations and emotions. His Y-Project describes a 50 min. curve that never loses its suspense and takes the musicians, friends and companion on board. 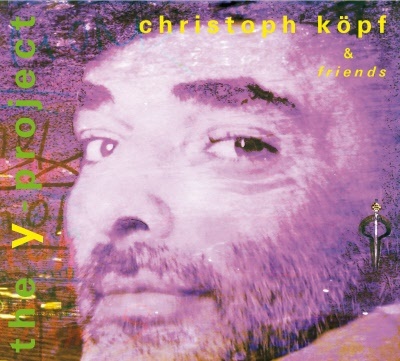 The Steyrer musician Christoph Köpf himself calls the music genre of his new CD “a cross over with strong ethic components”, he interprets by improvisation. The result is not only impressive but also touching, it reaches into our soul and the very core of (our) being. Apart from the unmistakable sounds, it impresses by the rhythm Christoph Köpf derives from his drums and percussions. The first track “bigcitymonk” (Großstadtmönch) alreadymakes clear where the musician´s roots lay. His uncle was a blacksmith who shaped the young man´s senses by the sound of the hammers and machines he used at work. Christoph Köpf was so mesmerized by this archaic craftsmanship that he wanted to become a blacksmith himself. Water, fire, air and iron (earth) suddenly became elementary parts of his life and their transformation into music and rhythm was only a matter of time. So it´s not surprising that his main instruments Fujara and Maultrommel (Jew´s Harp) are natural instruments, and that his music literally sounds earthy. What´s so remarkable about Christoph Köpf and his fellow musicians is the quality of the “zámmen g´spürns” as phenomenon of folk music traditions all over the world. Their music makes you experience (and hear) the wide range of stylistic elements, combining medieval, Tibetan, Native American, Irish Gaelic and alpine influences and (improvisation) at the same time.